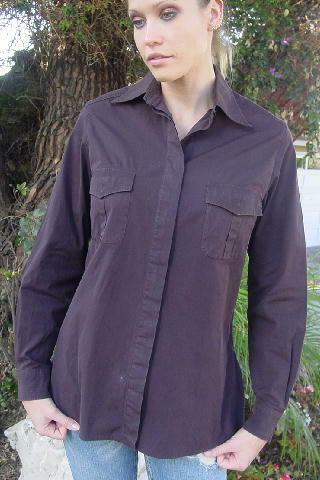 This vintage dark brown long sleeve shirt is 96% cotton and 4% elastin and was made in Italy by Max Mara. 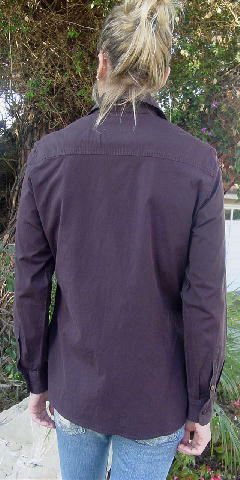 The long sleeves have one iridescent brown button on each cuff and one on each placket. 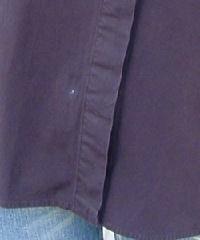 There are seven buttons down the front which are covered by a full length placket. It has two one button flap breast pockets and 6" long side seam bottom slits. The white spot near the bottom doesn't show when the shirt is tucked in. It's from a British model who used to wear it all the time with jeans and dark brown riding boots. shoulder to hem 26 5/8"
bottom hem side to side 21"